If you are living with chronic back pain in Kinston then you know it's no walk in the park. Almost everyone will experience some form of back pain, ranging from slightly irritating to completely debilitating, in their lifetime. Whatever the degree of pain you are experiencing and whether it is acute or has become chronic, at the very least you would probably rather live without it and in the most extreme cases in can be difficult to go on living with it. This article aims to help you to understand what causes low back pain, and how chiropractic treatment can help you achieve lasting back health, so that you can go on enjoying those walks in the park. It is important that this issue is properly identified and promptly treated to avoid further damage. A Chiropractor in Kinston will thoroughly assess your back to determine the extent of the issue and the appropriate treatment to prevent advancement of the herniation, and provide relief from the associated pain. Conditions such as obesity, arthritis, kidney stones, and urinary tract infections have been shown to cause symptoms of low back pain. These are all serious issues that need to be identified and treated immediately to avoid long-term health issues. 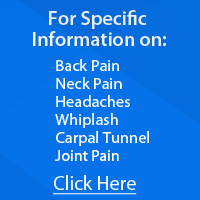 Kinston Chiropractic doctors are trained to identify these issues and support you to get the appropriate treatment. Many of these issues can have their source in spinal misalignments and respond well to chiropractic adjustments. If you have questions about how our team at Anderson Family Chiropractic Center can help you, please schedule a consultation today.